In the early summer of 1856 preparations were begun for the holding of a picnic of the Sunday School on Thursday, July 17. Fort Washington was selected as the likeliest place for it, and special trains for the excursion were chartered with the North Pennsylvania Railroad. Father Daniel Sheridan was given charge of all arrangements. He had made his studies at St. Charles' Seminary and had been ordained in St. John's Church, June 11, 1852, by Bishop Neumann, who had been appointed Bishop of Philadelphia and consecrated earlier that year, Bishop Kenrick having been elevated to the archiepiscopal see of Baltimore. The newly ordained priest was sent at once to St. Michael's. This meant that the parish henceforth was to have two assistants, for Rev. Joseph Ignatius Balfe, D.D., who had come earlier in 1852, was to retain his place. Father Balfe's predecessor had been Rev. James Cullen and before him there had been Rev. Hugh Kenny. "This learned, pious, and zealous priest - whose death has created the most profound sentiment of grief in the hearts of all who had known him - was born in Raphoe, County Donegal, Ireland, in the year 1821. His father, who kept a respectable school in that town, had communicated to his mind that thirst for learning and zeal for the extension of a sound system of education by which he was in after-life distinguished up to the hour of his death, and which he evinced by the extraordinary interest he took in the success of the parochial schools of St. Michael's and in the progress of the pupils in literature and religion, who were being educated therein. In the year 1839, at the close of the eighteenth year of his age, he arrived in this country, and was induced to proceed to Mobile, Ala., where he took charge of a school. Having already made considerable progress in his classical studies, and feeling within his soul a call to higher duties even than those of instructing youth, he resolved to dedicate his whole being to the service of his Divine Redeemer, and for this purpose commenced his novitiate at Frederickstown, Md., with a view of becoming a member of the Society of Jesus. "After some time his health became impaired, probably from over-exertion in study, and he was compelled to withdraw himself, under the advice of friends, until his health and vigor should be restored. When his health permitted he again resumed his studies, this time at Mt. St. Mary's College, Md. In this excellent institution his mind was prepared and his faculties trained to the exercises proper to fit him for the sacred office to which he so earnestly aspired. In 1851 he left that abode of learning with distinguished collegiate honors. He then applied for admission to the Theological Seminary of St. Charles Borromeo in this city for the purpose of completing his studies, and was received. In the unusually short term of one year here he was ordained, June 11, 1852, a priest of the Living God. The Reverend gentleman was immediately appointed one of the assistant pastors of St. Michael's Church, where he continued to fulfill the duties of his high calling until the day of his death. "Of his eloquence, his logical acumen and classical and historical research, many throughout the city can form a proper judgment from his able lectures delivered on various occasions on behalf of charity. But it is not upon these mere natural or acquired intellectual powers that the exalted character of a priest is built. He must have that humility which bespeaks, better than words can express, how much he feels of the majesty of God and the weakness of a creature, such as he is; and at the same time he must possess that noble dignity of soul which empowers him as the minister of God to direct, to teach, to restrain, to heal, or to console those who are committed to his charge. In piety, charity, discretion and zeal he should labor in season and out of season for the greater honor and glory of God. Such is the character of a true priest - not merely an ideal picture - but one for which Rev. Daniel Sheridan might have sat as the original. "With the young he was at once a playmate, a brother and a parent. Upon the altar he was the fervent priest, the earnest preacher and the careful guide. By the bed of sickness, of sorrow, of death, he was the personal friend, the angel of consolation, teaching how grief and pain should be borne and pointing to heaven, to which he sought to guide the footsteps of men. He seemed to live but for his flock, and in the eloquent words of the Very Rev. Dr. Moriarity, with them he died. He was to his congregation a living embodiment of the holiness and beauty of the Catholic Church. There was not one of the congregation who did not feel in his death the loss of a dearly beloved friend - nay, there was not a wailing parent or sister or brother within the church on Saturday last who did not feel their family bereavement doubled in the loss of their beloved pastor. "In conclusion we can only pray that his soul and the souls of all those who died with him may have eternal light and rest." To this outline of Father Sheridan's career may be added this information, not without historical value, that he preached at the dedication of the first mission house on Absecon Island - on the site of which chapel now stands the beautiful church of St. Nicholas, Atlantic City. Dr. Balfe, let it be remarked in passing, ordained at Rome, 1839, had spent some years with the Jesuits. He was permitted to remain at St. Michael's for only a year; at the end of that time Bishop Neumann chose him for the post of seminary professor. He taught at St. Charles' until 1860, when he was forced by ill-health to resign; but after doing parish work for several years at Columbia and" Kellyville he returned to the seminary, and died at the new institution in 1881. Rev. Francis O'Connor succeeded him at St. Michael's in the summer of 1853. In the year 1856 steam-cars were still regarded with wonderment and admiration. We can therefore readily imagine the excitement which attended the preparations for the Sunday school outing. Not only the children but the parents also who would be able to make the journey thrilled at the prospect of so glorious an adventure as riding through the country at great speed behind one of those strange, puffing monsters of iron. It is not unlikely that these simple people were still in awe even of the horse-drawn vehicles which moved so rapidly on rails past the church. A copy of Frank Leslie's Illustrated Newspaper of the day carried the picture of one of these conveyances in motion: the driver leans forward like a charioteer, reins in his left hand, whip upraised in his right; the horses appear to be in a mad dash; pedestrians are seen leaping frantically for safety. The North Pennsylvania Railroad Company established this rail line for horsecars in 1855. The route was from Willow Street along Front to Germantown Road, thence to Second Street and on to Beach and Berks Streets. It is opportune to remark here that in the office of St. Michael's Rectory there is a drawing of the church, which some have insisted is a representation of the first edifice; but this is disproved by several details, one of them being the car rails shown on Second Street It is of course, the present church that is represented, since so much enlarged and adorned. The North Pennsylvania Railroad for steam-cars was first incorporated in 1852 as the Philadelphia, Easton and Water Gap Railroad Company, for the purpose of connecting the City with the Lehigh coal region. The change of title was made in 1853. The road was finished as far as Gwynedd early in 1855, and this part was formally opened for travel Monday, July 2, of that year The main passenger depot called the Cohoquinoque Station, was at Front and Willow Streets; there was a small depot, the Cohocksink, on Master Street west of Second, and up at Washington (American) and Montgomery Streets was the Shackamaxon. In later years the main station of this road was to be located at Germantown Avenue and Thompson Street, and still later at Berks and American Streets. This railroad has been absorbed by the Reading System. The ill-fated Sunday school excursion of 1856 was to leave from the convenient Master Street depot. July 17, 1856, is recorded as excessively hot. The City was being scorched by one of those intolerable heat waves with which Philadelphians are afflicted every summer. The heavy and torrid air of the early morning presaged a day of the utmost discomfort for those who would remain on the City streets, but it must have made the excursionists think with anticipatory pleasure of the dense, cool woods and running streams of the country. The first excursion train was to leave Master Street at five o'clock in the morning and arrive at Fort Washington at 6 o’clock; the second would leave at 8.00 and also make the run in an hour. The schedule for the return in the evening called for departures from Fort Washington at 5:30 and 8:00. Twelve hundred tickets had been sold. About seven hundred persons were on hand to make the early trip. Father Sheridan directed the entraining with the assistance of members of the lay committee. This robust young priest had need of all his vigor to cope with the situation created by the impatient and excited children. He made every effort to keep the little ones in the rear cars where there would be less danger. The weight of the train of ten crowded cars was so great that there was difficulty in starting. Conductor Alfred F. Hoppel testified later that it left the depot at 5.10. The making of thirty miles an hour was required by the orders, but it was impossible to maintain this speed. It was necessary to make several brief stops because of trouble. 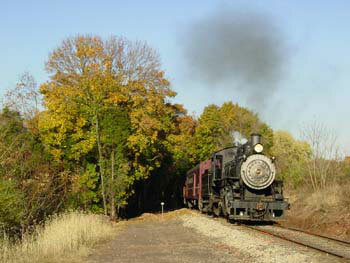 There was a stop of almost five minutes halfway between Chelton Hill and Tacony because the steam was low. When the train neared Edge Hill it was at least twenty-five minutes late. There was only one track to this railroad. And on this one track, through the peaceful countryside, disaster was moving swiftly to meet the happy children of St. Michael's. The train of regular daily service to the City left Gwynedd at 6 o'clock. It reached Fort Washington at 6.15, and Camp Hill at 6.18. The conductor, William Vanstavoren, had observed that the excursion train, which was to follow his own back to the City, was not at the Fort Washington siding. He inquired anxiously about it at Camp Hill, and receiving no information gave orders to proceed cautiously. Engineer Lee kept the shrill whistle sounding, making so deafening a noise, as he himself was to testify, that it was impossible to hear the approach of the other train. The conduct of Alfred F. Hoppel, responsible for the safety of St. Michael's picnickers, is amazing. He knew the schedule of the regular train bound for Philadelphia and consequently must have been aware that he was jeopardizing the lives of all entrusted to him. He violated the most essential law of this one-track road in not taking his cars onto a siding. His incredible action was to urge his engineer to pick up as much speed as possible so that the train passed the Edge Hill siding, the last opportunity for safety, moving at about thirty-five miles an hour. Between Edge Hill and Camp Hill in the vicinity of Dewey's Lane there was a curve along an embankment twenty-six feet high. The excursion cars thundered through a ravine and emerged on the curve, traveling with tremendous speed on a down grade. A second later the trains collided. The locomotives rose on end so that the fire boxes nearly touched, turned over and lay side by side. The sound of crashing woodwork, the hissing of steam, the screams and piteous moans of the victims succeeded the first deafening noise of the terrific impact. The three forward cars of the excursion train as well as two unoccupied freight cars of the other were smashed to pieces. The wreckage of St. Michael's cars caught fire immediately. Many persons were killed instantly, others burned to death. Children and women who occupied rear coaches and escaped serious injury jumped out, screaming in a frenzy of fear and grief. A crowd gathered quickly from neighboring hamlets, for the blaze could be seen for several miles. The heat of the burning wreckage was so intense that though protruding arms and legs and other parts of bodies could be glimpsed through the flame and smoke, it was impossible to approach to attempt a rescue. A small brook ran nearby. A bucket-brigade was formed and equipped with tubs, buckets, pails, kettles and other utensils supplied by the farmers but the effort to aid in this way was merely pitiful. The Congress Engine and Hose Company of Chestnut Hill shortly reached the scene and in a little while subdued the flames and began to extricate the victims. There were two small hotels, maintained for summer vacationers, one dwelling, a blacksmith shop and a shed within a radius of three hundred yards of the wrecked trains, and as quickly as possible the injured were removed to these shelters. Later the shop and shed were converted into morgues. Very Rev Dr. Moriarity, O.S.A., pastor of the new parish of Our Mother of Consolation, Chestnut Hill, and Father Barbelin, S.J., who was a guest at the home of Lawyer Hirst in the same locality: heard of the disaster and sped with all haste to give the ministrations of religion. Physicians hurried from Chestnut Hill, Edge Hill, White Marsh and Germantown. Among them was Dr. S. Weir Mitchell. Mrs. Mary J Ambler upon receiving the intelligence quickly gathered first-aid materials and covered the distance of two miles on foot. The service she rendered in caring for the injured was so conspicuous that after her death in 1868, the railroad company changed the name of the station near her home from Wissahickon to Ambler. The tragic news was brought to the city, spread through the parish. Men dropped their tools or left their looms and rushed from the factories, anguished women ran sobbing through the streets. Crowds of parents and other relatives of the children collected at the three stations clamoring frantically for transportation, and had to be restrained by the police from seizing and attempting to use the dangerous handcars. Coaches were attached to the one remaining locomotive remaining in Philadelphia, but they were given over almost entirely to Sisters of Charity, nurses and physicians with their equipment. The parishioners then sought horse drawn vehicles, and soon the Chestnut Hill Turnpike held a fast-moving procession of cabs, carts, wagons and drays. Some, however, bethought themselves of using the Chestnut Hill Railroad and walking the three miles from its terminus to the scene of the tragedy. Rev Francis O’Connor of St. Michael's and Rev John McGovem of St. Paul's went up as quickly as possible. more of the injured and thirty-one dead bodies. Because of the insistence of relatives some of the injured were taken to their homes; the rest were removed to hospitals - the Pennsylvania, St. Joseph's, Episcopal. Besides, the engineer of the excursion train, Harry Harris, was killed. The fireman, although thrown thirty feet into a field, suffered only abrasions and slight contusions. Alfred F. Hoppel escaped with the least of injuries. The engineer and fireman of the other train had been able to save themselves by leaping. The conductor, William Vanstavoren, upon returning to the City reported the accident officially and then went to his residence, 169 Buttonwood Street, and committed suicide by taking arsenic. "As early as five o'clock on the morning of Saturday, groups of persons who had relatives among the dead or who belonged to the congregation were scattered in .the vicinity, of the church. Before eight o'clock these isolated groups became one solid mass, all pressing forward to get a last view of the beloved priest by whose ministrations they had been so long edified, instructed and consoled. During the early part of the morning the Holy Sacrifice of propitiation had been offered up to the throne of mercy at each of the three altars in the church on behalf of the many deceased. The several pews were occupied by their immediate relations. "The body of the Rev. Mr. Sheridan was disposed in the manner usual with deceased clergymen; arrayed in sacerdotal robes, was laid in the richly-mounted coffin and placed in the centre aisle before that altar whereat he had so often officiated. The crowd outside was becoming every moment more and more anxious to get in, but the most perfect order was preserved. If they had been permitted to get in by crushing and pressing, lives would have been lost. This was provided against. The outer entrance at the iron railing was closed, and a considerable body of police was present and had a very important duty to discharge, which they did satisfactorily. Under the direction of the Rev. Father O'Connor of this church, upon whom the arrangements devolved, groups were admitted from time to time. They passed up the centre aisle, around the coffin, and cast one last, sad, lingering look on the countenance they were to see no more. They were passed down the south aisle and out to make way for others. In all this procession or pilgrimage, silent prayers arose from every heart, tears started unbidden to every eye, reverence was in every attitude and step. Judging from all that we have witnessed, we believe it hardly possible to estimate the depth of love, esteem and veneration in which this young clergyman was held. "Before and during the celebration of High Mass, several coffins containing the remains of some of the deceased were brought into the church and rested on the upper parts of the pews. They were laid feet towards the altar, the remains of the deceased clergyman being placed, as usual, facing the congregation. Many others for whom space could not be found without incommoding the congregation were placed in the basement. "The Solemn High Mass for the eternal repose of the Rev. Daniel Sheridan and those of the congregation who died in consequence of the same awful disaster, was commenced about nine o'clock. The Rev. P. F. Sheridan of St. Paul's (an uncle of the dead priest) officiated as celebrant; Rev. Edward O'Brien of St. Malachy's, deacon; Rev. John McGovem of St. Paul's, subdeacon. Thirty-four priests were present, taking part in the celebration. Immediately after the offering of the Holy Sacrifice, the Very Rev. P. E. Moriarity, D.D., O.S.A., delivered the sermon. "After the sermon the usual psalms were sung and the coffin containing the remains of the Rev. Mr. Sheridan having been closed up, a procession of the clergymen preceded by the cross-bearer, carrying a large-sized crucifix draped in mourning, followed the body to the burial ground adjoining the church. Immense crowds followed, and amongst them there was not one who did not evince the deepest emotion. Other bodies which lay in the church immediately followed and were also interred. On Sunday the bodies of nine others were interred. The number of persons whose remains could not be identified was eight; these were buried under the arrangements of Mr. Hookey, the undertaker, along with the others." On Sunday, too. Mass was offered for the victims in every Catholic church of the City. Coroner Daniel Jacoby of Montgomery County impaneled a jury and opened an inquest at the Fort Washington Hotel, as did Coroner Delavau in Philadelphia. Some startling testimony was given during these inquiries. Edward Boyle and Frank McAnany, both of St. Michael's, had gone into McClain's tavern opposite the depot early on Thursday, July 17, and there overheard Harry Harris, the engineer, who was killed instantly in the collision, declare that he "would drive them all to Hell." A railroad man, Mr. Lee, who in fact was engineer of the other train, submitted hearsay evidence that the difficulties which caused the excursion train to be late were due to greased rails. The juries disregarded such statements and after a thorough investigation into railroad schedules, orders, siding locations, and similar details, charged the disaster to the negligence and disobedience of Conductor Alfred F. Hoppel. Mr. Hoppel was a Kensington Protestant - a description which in those days connoted a most intense hatred of Catholics. But it is unbelievable that he or anyone else, not to speak of a group, would seek to compass the death of hundreds of children. Such a man would be a human devil, a monster of evil, a modern Herod. But the horrors of May, 1844, were still vividly remembered in St. Michael's Parish, and the recent criminal excesses committed by the Knownothings in various parts of the country - it was not yet a year since the Bloody Monday at Louisville - had kept the people for some time in a state of apprehension, so it is not surprising that rumors of a plot to slaughter the children on their outing should have sprung up and persisted. John J. McDevitt of 842 N. Second Street, wrote and published a lengthy account of the tragedy in verse, in which he expressed his conviction of the guilt of the bigots. This poem if it may be called such, was circulated through the City parishes and made a lasting impression. One effect of the fear engendered was that for some years afterwards Catholic organizations in chartering trains for excursions demanded the right to pass upon the acceptability of the train crew. The whole nation was horrified at the tragic news. Newspapers in every part of, the country carried leaders demanding that railroad companies improve their methods and equipment and make the safety of passengers their first consideration. This was everywhere described as the worst disaster in the history of steam-cars. In the parish itself hysterical grief quickly yielded to the calming influences of religion. Faith sustained the people, soothed them, and whispered its sweet message of hope to their sorrowful hearts. Whatever credence was given in the circumstances to rumors of greased rails and similar stories, there was never the least manifestation of passion. They understood that God saw all things and permitted the tragedy for His own good purpose; it was necessary to humble themselves before Him, to submit patiently to His holy Will. This was their supreme hour of common trial and they came through it with unwavering trust in the goodness of their Maker. Rev. John Quinn took Father Sheridan's place, and when shortly afterwards he was given sick-leave. Rev. Daniel Kelly was appointed curate. In 1858 five Christian Brothers were placed in charge of the boys' department of the school. Their residence was at 1421 N. Second Street, in which house a few years later they opened high school and academy classes. Brother Feliow was director. The next year efforts were made through Rev. Edward J. Sourin, who had joined the Jesuits, to obtain the services of the Sisters of the Holy Cross for the girls' department, but without success. Father Loughran called on Bishop Neumann and explained his disappointment, whereupon the good bishop promised to get the Sisters of St. Joseph for him. The Board of Trustees received the announcement with great satisfaction. Negotiations were carried on with Mother St. John, and in 1860 five sisters of the order came to displace the lay teachers, who were very reluctant to depart; the number was increased to seven within a year. Rev. F. P. Mulgrew succeeded Rev. Francis X. O'Connor, who had been a curate here for six years, and Rev. Henry Wright shortly succeeded Father Mulgrew. Evidently in those days, as at present, assistant priests were frequently on the move. Father Loughran never recovered physically from the shock of the disaster. His health failed steadily, though he continued his labors. He presided for the last time at a meeting of the Board on April 5, 1861. It happened that the only business transacted at this brief session was the presentation and approval of a bill for work done in the school by Arthur Nugent, to whom twelve years or so before the time of this writing the author administered the last sacraments in St. Stephen's Parish. Mr. Nugent was a Christian gentleman; a man of quiet dignity, irreproachable character, and of an intense devotion to the faith. His family became very prominent in the life of the parish, and though it is now many years since their removal to St. Stephen's, their loyalty to St. Michael's is still manifested at every opportunity. Before the end of April Father Loughran sailed for Ireland, wishing to die at his old home. The heart of this gentle priest was heavy with sadness when he bade his flock farewell, knowing he would never see their dear faces again in this life. The people themselves, with their fine Irish tenderness, would have had compassion for any priest in such circumstances, and now that it was the case of their own dearly loved pastor, the one who had led them, encouraged them, suffered with them, worn himself out for them, they could not be comforted. We find this reference to him in a business report of a previous Board meeting: "We all hope that when we all have passed away, the noble work begun by him will be continued by his successor with the same zeal" - a sentiment in which there is an implicit prayer that he might survive them all. He had the satisfaction in departing of seeing the promise of great Catholic strength in Kensington, and indeed through the entire diocese, which then included the State of Delaware. That part of New Jersey, let it be remembered, which had belonged to Philadelphia, was now in the Diocese of Newark. The Diocese of Pittsburgh had been formed long before. James Frederick Wood, the former coadjutor, was the Bishop of Philadelphia, having assumed charge at the death of the saintly Neumann. Father Loughran died in October, 1861, at Cookstown, Gynne, Ireland. Rev. Thomas Kieran, ordained in the seminary chapel October 30, 1854, had already been appointed to succeed him, and in fact had taken possession at the beginning of June. A little later there were new curates at St. Michael's, Rev. Bernard T. McCallum and Rev. Francis A. Sharkey. Father Kieran's tenure was brief, for in 1864 on the passing away of the Rev. Hugh McLaughlin under whom he had served as curate, he made application successfully for the pastorate of St. Anne's - the parish to which he was inalienably attached and in which he was destined to accomplish great things. In those three years at St. Michael's he worked indefatigably, and . at the time of his transfer was considering plans for the enlargement and beautification of the church. He was intensely interested in the parochial school and wisely directed the expenditure of money left for its improvement and development by Michael McGrath, Michael McGill and William McGlinchy. The trustees not already mentioned who served so far in the history of the parish are: John Lynch, Dennis McCrystal, John Heron, John Kelly, John Eicock, John Marlow, John A. Dougherty, Lawrence Dillon, Patrick Corr, John Schoales, Cornelius Kelly, Alexander McConnell, George Kelly, Thomas Harkins, John Nolan, Michael McEvoy, Dennis McCloud, James Dillon, John McGahan, Joseph Hookey, and Michael Magee.